Entrance to Antioch Cave with whirlpool, circa 1995. On April 16, 2007, a contract was signed between the Texas Commission on Environmental Quality (TCEQ) and the District to construct Best Management Practices (BMP) structures over caves on Onion Creek to improve the quality of water recharging the Edwards Aquifer and to enhance the amount of water recharging the aquifer along Onion Creek. 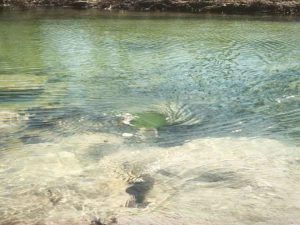 The majority of recharge to the Barton Springs segment of the Edwards Aquifer is through recharge features such as caves, sinkholes, and solutionally enlarged fractures that are located in the beds of creeks that cross the recharge zone. Because this is a karst aquifer with conduits carrying large volumes of recharged water to various parts of the aquifer and to the springs, only a limited amount of filtration and settling occurs. Since this water comes from rainfall runoff and creek flow, it contains varying amount of sediment, bacteria, and other contaminants. Antioch Cave situated on Onion Creek about 1.3 miles west of Buda, is considered to be the most significant recharge feature within the District (Figure 1). 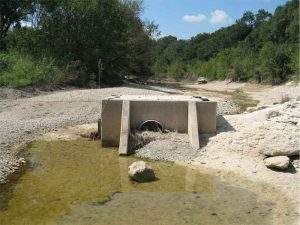 Onion Creek is the main contributor of recharge to the Barton Springs segment of the Edwards Aquifer, contributing an estimated 45% of total recharge. In 1997, a BMP was constructed over the entrance to Antioch Cave as part of an earlier 319(h) grant (Figure 2). This structure was built with an air-pressure activated valve so that the valve could be maintained in the closed position during periods of storm-water flow and which could then be opened when the quality of water improves as the storm pulse recedes. Because of the remote location of the cave, it is not possible to have the valve in the appropriate position at all times. 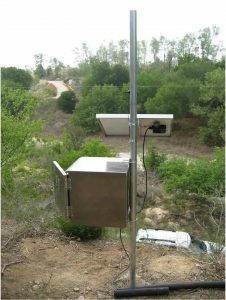 As part of the current grant, a Continuous Water Quality Monitoring Network (CWQMN) system was installed at Antioch (Figure 3). This system consists of a water-quality probe with temperature, conductivity, turbidity, and pressure sensors. Data from the probe are sent by telemetry to the TCEQ Leading Environmental Analysis and Display System (LEADS) where the data are available to the public through the internet. The level of turbidity in the water will determine when the valve is opened or closed. As a storm pulse reaches Antioch Cave, the valve will be closed if it is in the open position. When turbidity levels decrease to baseflow conditions, the valve will again be opened to allow the better quality water to enter the structure. An intake structure was also installed on the BMP to minimize the amount of sediment and debris entering the cave (Figure 4). This structure will also improve the quality of water entering the aquifer and will keep the cave from clogging with sediment and debris. Since the additions were made at the Antioch site during the summer of 2008, there has been no flow in the creek due to the drought that started in early 2008. A similar BMP and CWQMN system are planned for another site on Onion Creek. The best recharge features for this purpose are located on City of Austin (COA) Water Quality Protection Lands upstream from Antioch Cave. Construction will start on the second site when an agreement is in place with COA for access to the site.